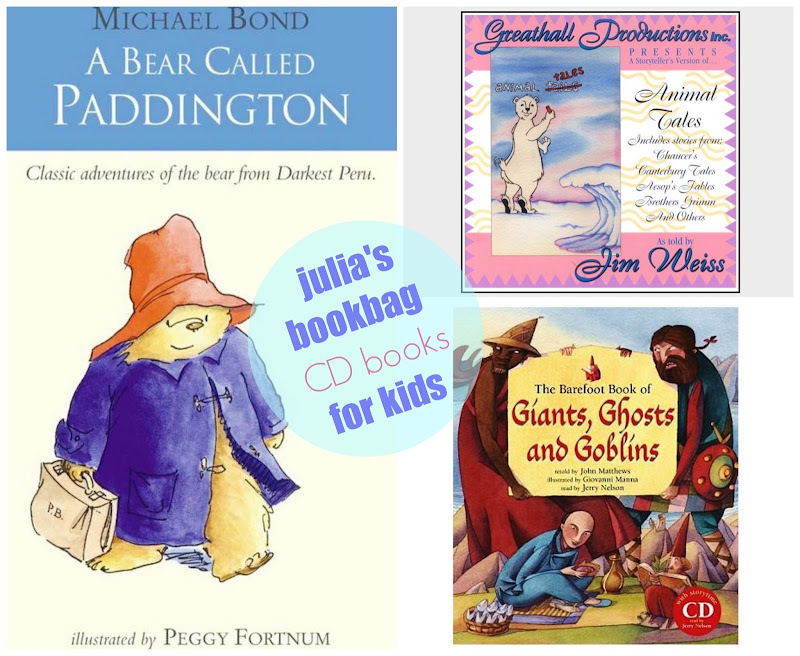 Julia's Bookbag: Awesome CD Books for Kids! 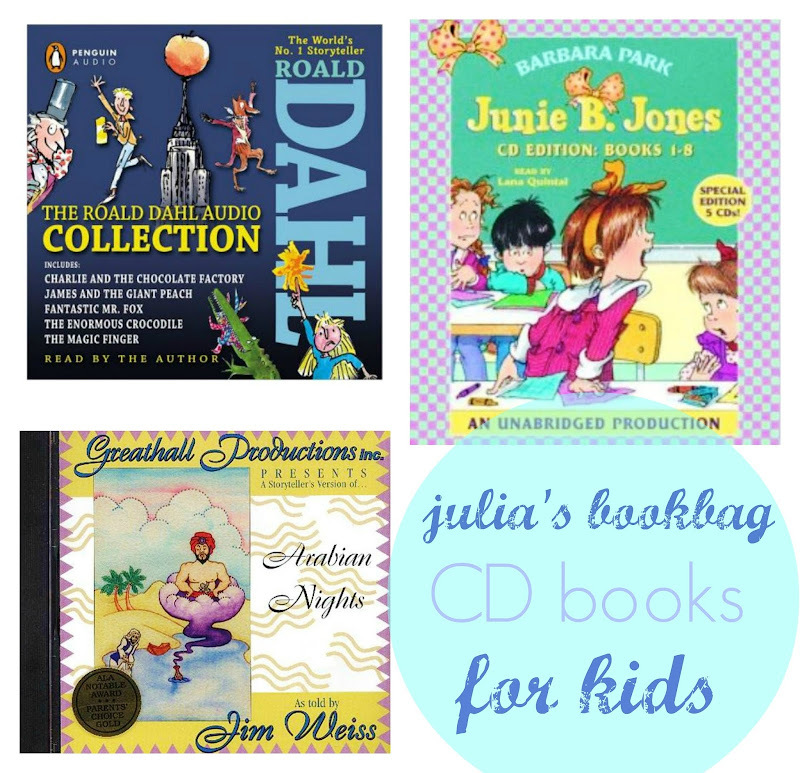 Awesome CD Books for Kids! 1) 'The Roald Dahl Audio Collection'. This one is FANTASTIC and it's read by The Man himself, Roald Dahl! I read one review that said he was hard to understand. RUBBISH. He's clear as a bell, does a marvelous job, and he has a great voice. 2) 'Arabian Nights', narrated by Jim Weiss. Julia knows this guy by name now. HE IS A STORYTELLING MASTER. You must must MUST seek out any and all Greathall Productions audio books done by this guy. The best. We have at least a half dozen of them! 3) We don't have this 'Junie B. Jones' set, but I think we should. 4.) We've had 'A Bear Called Paddington' for awhile now. It's read by Stephen Fry, who is so droll and British and wonderful. Julia listens to this one over and over and over. It's been in constant rotation since we got it! Can't praise it enough. 5.) More Jim Weiss in 'Animal Tales'. This was our first Greathall Productions CD and one of our very favorites. Super funny, this one. 6.) 'The Barefoot Book of Giants, Ghosts and Goblins' is not a bit scary. There's only one ghost, and he's quite nice. I think in the goblin story, the goblin eats jam and cakes. The 'Fin M'Coul' story is Julia's favorite. I have such fond memories of listening to story records when I was little. It makes so happy to see my kiddo enjoying audio stories as well. And let's face it, as much as I love to read stories to her, I can't read all the time, whenever she wants me to. Really, it's true. Audio CD books are total lifesavers and jolly good fun to boot. Julia and I enjoy talking like Stephen Fry now. Basically we pretend to be British whenever we can. Brainwashing! I've successfully turned my kid into a faux Brit! How I miss those storybook records! So fabulous that yours were saved! I have never been a big fan of audio books but it's due mostly to my inexperience with them. You sold me on the Paddington book and OMG Stephen Fry??? So so hunting for that! I had accompanying picture books that went along with most of my old records. Julia's CD's rarely come with a book, some do, esp the ones from Barefoot Books. But she doesn't care, she just lays on the floor and plays while listening to a story. And they are pure brilliance in the car! I can't wait to audio with my kiddo. We just got a bunch of new ones b/c we had had the old ones for a long time and she was growing a bit tired of listening to the same ones all the time. We also get them from the library. She is way way into them! REALLY good for car rides! We are currently listening to "Mr. and Mrs. Bunny--Detectives Extraordinaire" in the car, which is INCREDIBLE. It's really a little beyond my 8-yr-old, but I figure it's good to stretch her vocabulary. My 5-yr-old tunes in and out, but the 10-yr-old and I are loving it. SO CLEVER. We need an extra CD player for the house, or we'd listen to more of them. We also like Storynory podcasts--"The Nose That Ran Away" is a particular favorite. Oh FUN Melissa! I've heard those books are amazing! Can't wait to read those! YES! I love audiobooks! I listen to them when I draw/paint. Merge the 2 things I love! When she's ready, I love Rick Riordan's books. Super funny! You are breaking my bank, lady! We're headed to Chelan next week and just ordered two of these for all of us to listen to on the rides over & back.